When it comes to location, the Flora Apartments in Puerto Pollensa take some beating. The beautiful sandy beach is just 100m from this 3star complex and the centre of resort virtually on the doorstep. The lowlevel whitewashed apartments cluster around the swimming pool, with abundant sun beds and terraces alongside. Mum and Dad can spend their days topping up their tans poolside or chillingout in a shady spot with the latest bestseller. The adjacent pool bar will keep them going with cocktails and cold beers. The children will have a whale of a time too, with their own section of the pool and a playground onsite. Inside, the apartments are bright and modern. Each comes with comfy seating, separate bedroom, fully equipped kitchenette and a balcony. If cooking is not on your holiday agenda, the snack bar does light bites and the restaurant serves buffet style fare. Evening entertainment consists of family games and quizzes and occasional live shows. Discover why the Flora Apartments are a popular choice for a family holiday in Majorca. 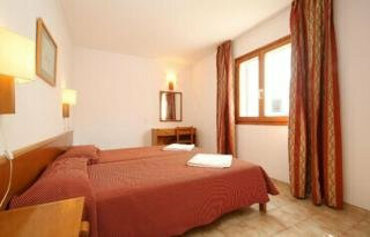 The Flora Apartments have all the facilities you would expect of 3star apartments in Puerto Pollensa. Highlights include: a large outdoor swimming pool with sun terraces, sun beds and parasols, gardens, air conditioning, bar, restaurant, snack bar, playground and games room. Additionally, there is a 24/7 reception, prepaid WiFi in the lobby and pool area, car and bicycle rental, animation team, safety deposit boxes and internet facilities. The apartments are self catering, but there is an option for guests to upgrade to bed & breakfast or half board. There is a buffet style restaurant offering a wide selection of local and international dishes. The Pool bar is the place for cooling drinks and light bites, with an openair terrace to relax. Family friendly games and quizzes, along with occasional live shows, are on the menu in the evening. The Flora Apartments consist of eight blocks with a total of 88 one bedroom apartments. All apartments have a full HD LCD TV, air conditioning, fully equipped kitchenette, laundry, internet, phone and safety deposit box. 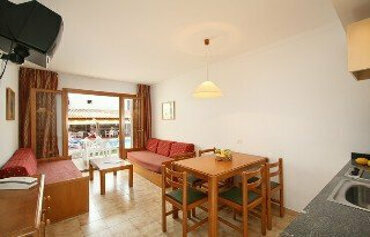 The Flora Apartments are located 100m from Puerto Pollensa beach. There is a palm lined promenade nearby with a marina, boutiques, cafes, bars, restaurants and nightlife. 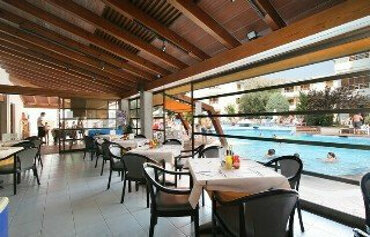 Puerto Pollensa is approximately 60kms from Palma Airport.